A 28-year-old Kansas man was shot and killed by police officers on the evening of Dec. 28 after someone fraudulently reported a hostage situation ongoing at his home. The false report was the latest in a dangerous hoax known as “swatting,” wherein the perpetrator falsely reports a dangerous situation at an address with the goal of prompting authorities to respond to that address with deadly force. This particular swatting reportedly originated over a $1.50 wagered match in the online game Call of Duty. Compounding the tragedy is that the man killed was an innocent party who had no part in the dispute. The following is an analysis of what is known so far about the incident, as well as a brief interview with the alleged and self-professed perpetrator of this crime. It appears that the dispute and subsequent taunting originated on Twitter. One of the parties to that dispute — allegedly using the Twitter handle “SWauTistic” — threatened to swat another user who goes by the nickname “7aLeNT“. @7aLeNT dared someone to swat him, but then tweeted an address that was not his own. Swautistic responded by falsely reporting to the Kansas police a domestic dispute at the address 7aLenT posted, telling the authorities that one person had already been murdered there and that several family members were being held hostage. A story in the Wichita Eagle says officers responded to the 1000 block of McCormick and got into position, preparing for a hostage situation. “Livingston didn’t say if the man, who was 28, had a weapon when he came to the door, or what caused the officer to shoot the man. Police don’t think the man fired at officers, but the incident is still under investigation, he said. The man, who has not been identified by police, died at a local hospital. Not long after that, Swautistic was back on Twitter saying he could see on television that the police had fallen for his swatting attack. When it became apparent that a man had been killed as a result of the swatting, Swautistic tweeted that he didn’t get anyone killed because he didn’t pull the trigger (see image above). Swautistic soon changed his Twitter handle to @GoredTutor36, but KrebsOnSecurity managed to obtain several weeks’ worth of tweets from Swautistic before his account was renamed. 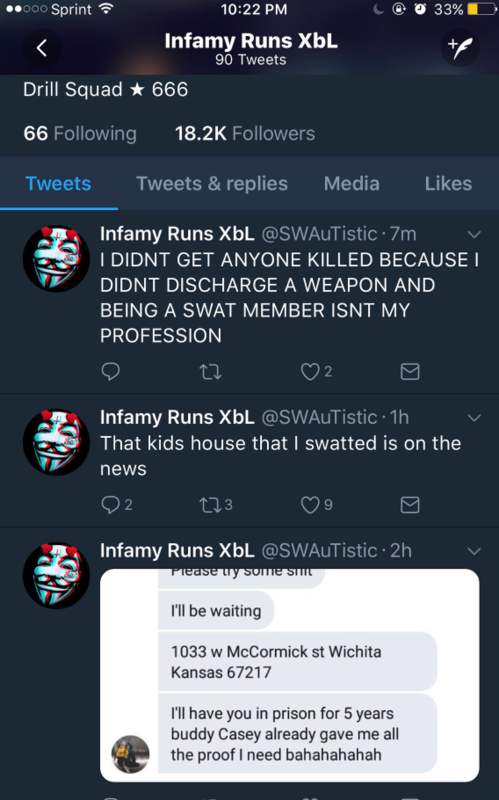 Those tweets indicate that Swautistic is a serial swatter — meaning he has claimed responsibility for a number of other recent false reports to the police. Among the recent hoaxes he’s taken credit for include a false report of a bomb threat at the U.S. Federal Communications Commission (FCC) that disrupted a high-profile public meeting on the net neutrality debate. Swautistic also has claimed responsibility for a hoax bomb threat that forced the evacuation of the Dallas Convention Center, and another bomb threat at a high school in Panama City, Fla, among others. After tweeting about the incident extensively this afternoon, KrebsOnSecurity was contacted by someone in control of the @GoredTutor36 Twitter account. GoredTutor36 said he’s been the victim of swatting attempts himself, and that this was the reason he decided to start swatting others. He said the thrill of it “comes from having to hide from police via net connections.” Asked about the FCC incident, @GoredTutor36 acknowledged it was his bomb threat. “Yep. Raped em,” he wrote. But evidently not enough to make him turn himself in. Update, 7:15 p.m.: A recording of the call to 911 operators that prompted this tragedy can be heard at this link. The playback of the recorded emergency calls starts around 10 minutes into the video. Update, Dec. 30, 8:06 a.m. ET: Police in Los Angeles reportedly have arrested 25-year-old Tyler Raj Barriss in connection with the swatting attack.